← Why Don’t We Eat Bugs in Western Culture? Dr. Julie Lesnik, before conducting an enlightening interview with me about the present and future of entomology, gave an engaging talk as part of UGA’s entomology seminar series about our very distant past plays a role in how we currently view insects. As our question, “why does the West have such an aversion to eating insects” is so complex and involves our past, present, and future, I thought I’d sum up the main points from Dr. Lesnik’s engaging lecture. Why are insects viewed as disgusting? Why are they not viewed instead as Friday night’s take out or a gourmet delicacy? Before we dive right back into the complete road map of human history, we should talk about where we are today in terms of resources. 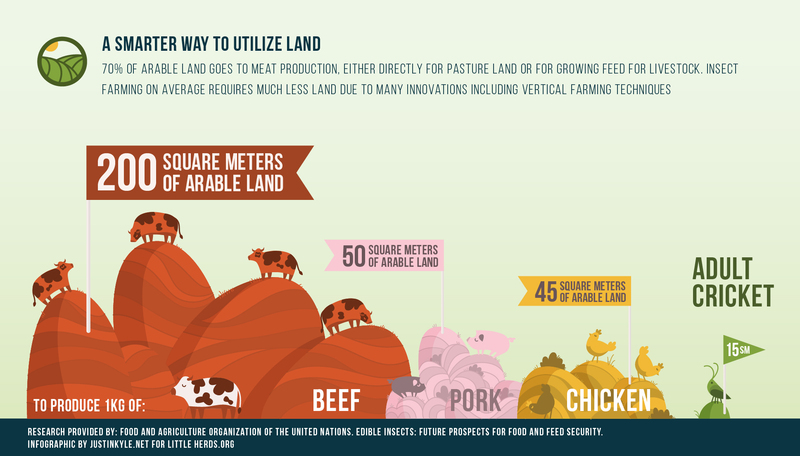 The meat industry takes an exorbitant amount of resources in terms of land and water. Not only do you have to be mindful of how much land cows need to poop on and how much water they drink, but also how much land and and water the corn they eat uses. How to sustainably use our water supply is a conversation we need to have *now*. 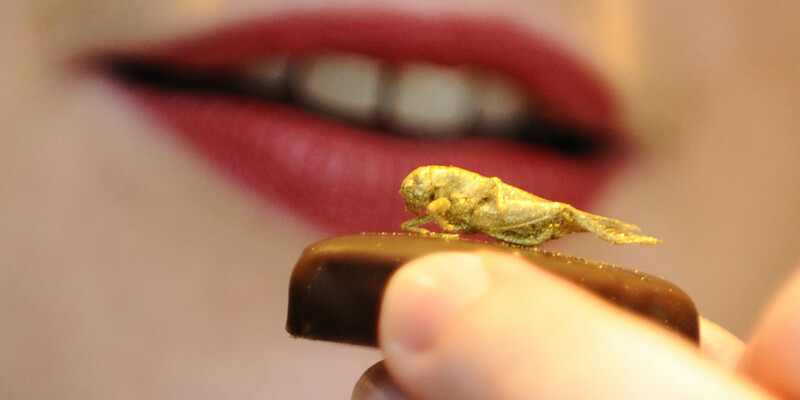 So that leads us into using insects as a food source. They’re easy to rear, are amenable to vertical farming, and take a fraction of the resources that our other meat products use. But, there’s a huge cultural aversion to snacking on these leggy creatures. Why? Because, it’s never really been a part of our evolutionary history. We know that brains are energetically expensive. That large hunk of grey matter sitting atop your neck requires a lot of energy for it to function. Diet dictates the upper limit of brain sizes. The better your diet is, the higher quality stuff you put into your system, the better you can support a large think tank. But what is a “higher quality diet?” Leaves and other fibrous plant matter like leaves or celery is generally considered “low quality”. Fruit is considered to be “high quality” because of its sugar content, vitamins, and minerals. Animal fats and proteins also constitute a “high quality” diet and includes everything from cows to termites. Our last common ancestor with chimps was about 6 million years ago and was neither human nor chimp, but had a similar brain size and similar living conditions. By studying apes and chimps today we can reconstruct what they were doing. And they were eating insects like ants and termites. However, the types of termites those early homonids were eating depended on what nutritional things other parts of their diet were lacking. For example, chimps today selectively eat termite soldiers. They do this by sticking a feathered stick into a termite mound, waiting for the aggressive soldiers to latch on, then pull the stick out and slurp the termites off. These termites are very high in protein something that the chimps lack in their very fruit based diet. Gorillas just punch mounds to the ground and eat the workers. Since the workers are eating dirt all the time, the gorillas get the micro-nutrients that they need that are lacking from their leafy green salad entrées. Social insects, like ants and termites were sought after because they’re easy to catch. Once you find one nest you can keep going back and it’s relatively risk free. Female and young chimps are the ones that dig around the termite mounds while male juveniles and adults fight over the social hierarchy and do risky boy things. Basically, a termite mound is a high calorie buffet with practically no associated risk. 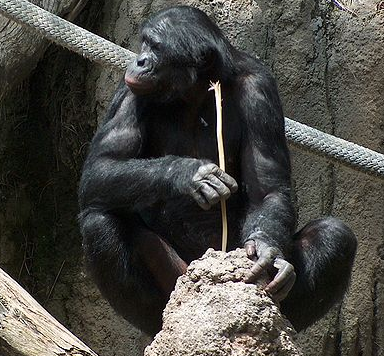 A chimp using a stick to extract termites. 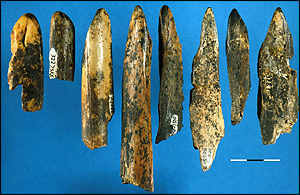 Early bone tools used for digging up termites. 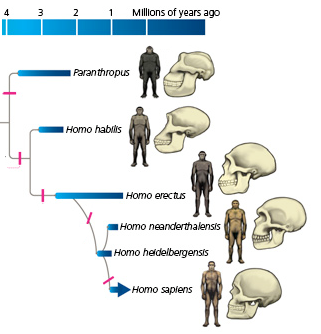 About 4 million years ago, Australopithecus entered the battle field. These guys walked on two legs and had the brain power to make tools out of bone but were chimp-like in all other aspects including appoximate brain size. They probably ate a lot of fruit and like chimps using their feathered sticks, Au. robustus, used bone tools to dig for termites. How do we know this? Scientists made their own bone tools and used them to pull bark off trees, dig for tubers, and dig for termites. When all was said and done, the microscopic wear pattern on the bone tools used to dig for termites matched the wear patterns found on the fossil bone tools. 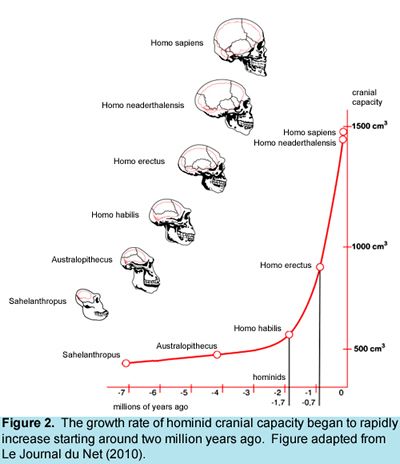 Homo erectus evolved about 1.9 million years ago and had a brain capacity similar to ours. These people were the first to control fire and cook their food which contributed to their large brain size. Just about as quickly as they evolved in Africa, they up and left, inhabiting much of Indonesia and the temperate zone. These people formed communal groups and probably foraged for insects much like modern human foragers. Regardless of the causes that led to their brain size, they still needed a lot of protein in their diet to sustain themselves. Protein that they obtained both with what we would consider traditional meat sources and insects. Neanderthals (Homo neanderthalensis), and possibly other early modern humans, moved north, braving glaciated Europe about 250,000 years ago. As you could image, if struggling through several feet of snow is part of your daily routine, eating insects isn’t. Neanderthals had to subsist mainly from big game. Practices of insect foraging and eating were lost to these people living in the frozen wastelands as there simply weren’t any to be on the menu. 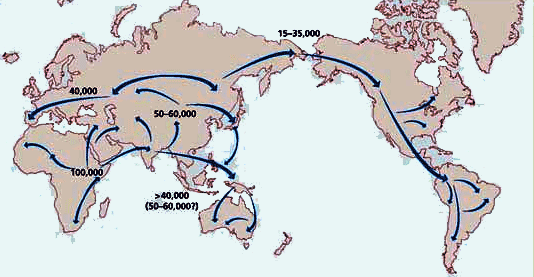 From here, some modern humans went on the move and traveled from modern day Siberia, across the ice bridge to North America. Some groups stayed and colonized what is today’s Canada and United States and others continued to migrate into Central and South America. It’s in these tropical regions, especially in the Amazon, where insect eating was readopted. Insect eating today is generally considered to be tropical however, nothing’s quite that simple and some other factors are at play. 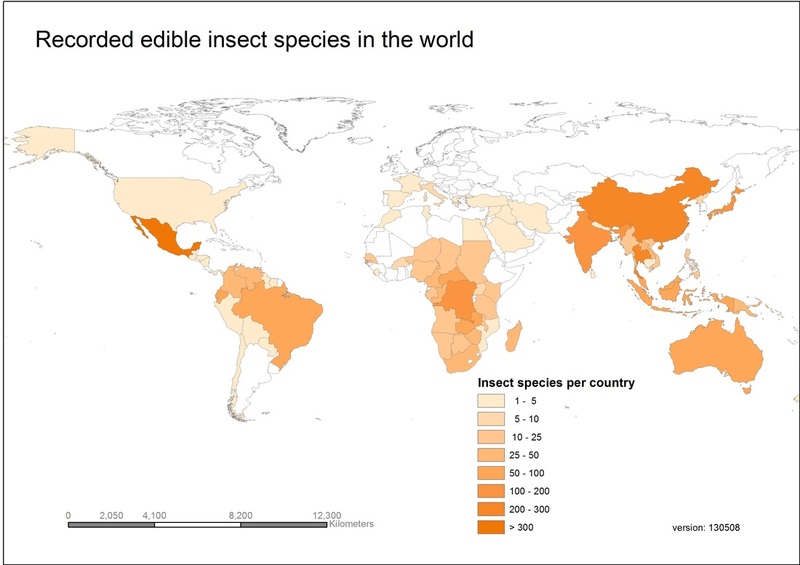 Take a glance at this fancy map that shows where people today mainly eat insects. Eating insects is mainly a tropical thing. PC: Jongema Y. 2012; Wageningen University. We only have data for countries and not provinces or states. So it looks like China breaks our trend, but most of the insect consumption happens in Southern China. That doesn’t mean that you can’t get insects in other places in China, just where it’s most popular. Several countries in South America and in Africa also break this trend. But that’s because these areas are generally either in the mountains (South America) where it’s colder and drier or located in the desert (Africa). This is where agriculture flourished. As counter intuitive as it may seem, agriculture first appeared in places where foraging hunting and gathering is not a viable option. To survive in dry regions, since the environment is not particularly hospitable, you have to find ways to perpetuate the plants and animals that you depend on. While insects aren’t rare in these ecosystems, they’re generally harder to find and collect in addition to being much smaller. Therefore people wouldn’t have initially readopted eating insects or relied on using them as a food source, especially since they were now a people who had not subsisted off of insects for thousands of years. Places that had readopted or always eaten insects also turned to agriculture later in their history because growing and raising food is always less risky than trying to find it or chase it down. Plus, through agriculture, you can sustain larger populations.However, in these areas, insect eating wasn’t lost and still continues to make up an important part of the culture and diet. There are a couple things at play. 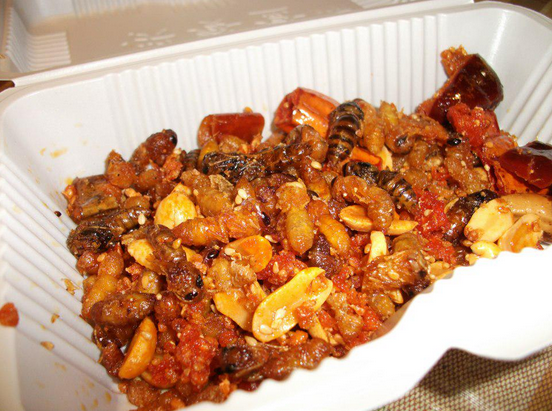 Insect eating was an important aspect of our diet as human evolution progressed in Africa. However, once Neanderthals and others left Africa and lived in snowy, glaciated Europe about 250,000 years ago, there were no insects to eat. People migrated into the Americas around 15,000 years and insect eating was readopted in the tropical regions of South America in places that agriculture wasn’t immediately developed. Basically, if you’re Native American or from a culture descended from Europeans, insect eating was never part of our evolutionary history. Since insects are a great source of protein and currently more sustainable than our other meat options, perhaps we should all give them a try. And maybe even try a few? 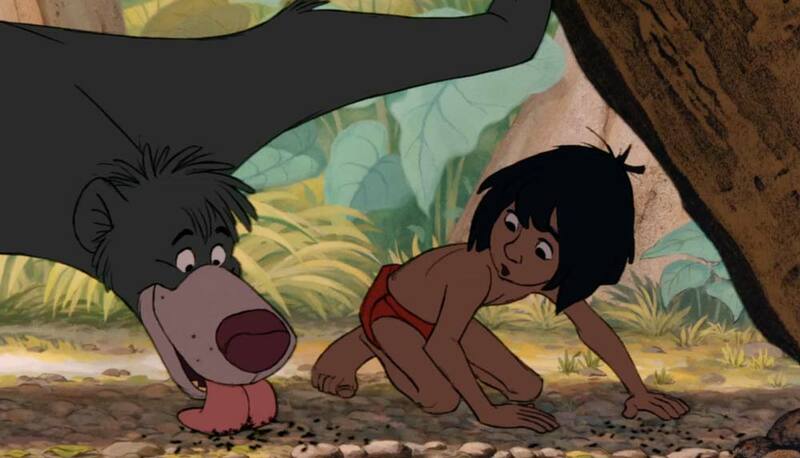 The bear necessities will come to you. Allen KL and Kay RF. 2012. Dietary quality and encephalization in platyrrhine primates. The Royal Society Proceedings B 279: 715-721. Azevedo KF and Herculano-Houzel S. 2012 Metabolic constraint imposes tradeoff between body size and number of brain neurons in human evolution. PNAS 109(45): 18571-18576.
d’Errico F, Backwell LR, Berger LR. 2001. Bone tool use in termite foraging by early hominids and its impact on our understanding of early hominid behavior. South African Journal of Science 97: 71-75. Lesnik J. 2015 “Entomophagy and Evolution: Eating Insects Past, Present and Future” Seminar at the University of Georgia. Van Huis A, Van Itterbeeck JV, Klunder H, Mertens E, Halloran A, Muir G, Vantomme P. 2013. Edible Insects: Future prospects for food and food security. Food and Agriculture Organization of the United Nations. This entry was posted in Culture and tagged Edible Insects, Entomophagy, Human Evolution, Sustainability, Termites. Bookmark the permalink.